Pizza lovers, rejoice! Bestselling cookbook authors Bruce Weinstein and Mark Scarbrough are back with an exciting new collection of ninety classic, international, and modern recipes for everyone's favorite food. Finally, here's a book that lets you have it both ways—on the grill and in the oven. Bake a pie tonight for that traditional pizza-parlor taste or grill one this weekend on the deck or patio, and you'll discover what home chefs across the country are realizing: the grill is a great way to get a hot pie on the table. Bruce and Mark adapt their recipes so that you can use a homemade dough, a store-bought one, or even a prebaked crust. 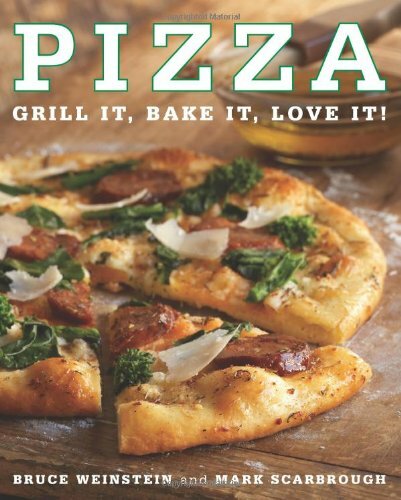 With recipes for three sauces and eight crusts, Pizzamakes America's favorite food easier and more fun than ever. From the well loved to the adventurous, Pizza is full of Bruce and Mark's foolproof recipes that are sure to please every palate. There's something for everyone: classic pies like the cheese-laden Pizza Margherita and the Four Seasons Pizza, international pies revamped for the American kitchen like the Armenian Lamejun Pizza and the Alsatian Tarte Flambé, light salad pies like the BLT Pizza, and modern twists on old favorites. Try a Philly Cheesesteak Pizza or a Pot Pie Pizza, modeled on those American comfort-food classics. Pizza also offers ten recipes for Chicago-style deep-dish pies and a host of fun appetizer pies, making pizza perfect for every occasion.